Todd Frazier wondered if going to church more would help the White Sox break out of their funk. Then the Chicago third baseman suggested a scuffle with teammate Adam Eaton. Church or war as an answer to all of our problems? Ladies and gentleman, I give you Todd Frazier, the next nominee for President of the United States for the Republican Party! Yeah, I know. “Stick to baseball.” Fine: Melky Cabrera doubled twice and drove in two runs. Miguel Gonzalez allowed one run on three hits over six. I’ll hit the Democrats back the next time a ballplayer claims that his kind, culturally aware statements which signal solidarity of identity excuse him from actually having to do things which help people of that identity in a practical way. Mets 5, Brewers 2: Bartolo Colon allowed one run over seven innings while scattering eight hits. The only run scored when a ball was smashed into the chest of second baseman Neil Walker off the bat of Hernan Perez. Terry Collins: “He said it hit him right in the heart and that he couldn’t catch his breath.” I’ve never see Hernan Perez before, but I’m assuming this is him. Does an Ox Baker reference make up for that political jab? It really should, you know. Ain’t no other baseball writer dropping Ox Baker bombs at 8am. 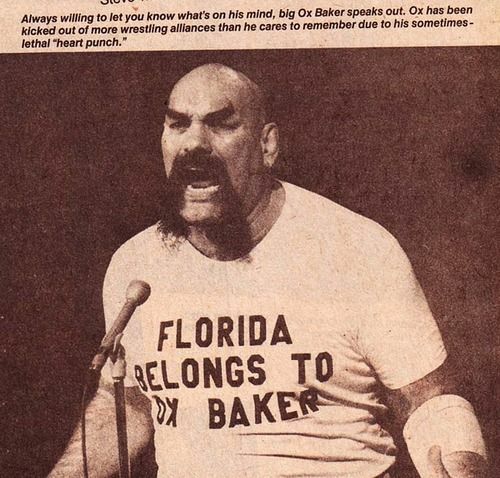 Florida belongs to Ox Baker. Don’t you forget that, Ronnie Garvin. Marlins 10, Twins 3: Marcell Ozuna had four hits and three RBI. Christian Yelich had two hits and an RBI. Chris Johnson hit a pinch-hit, two-run homer. The Twins losing probably made them sad which, based on what I heard in response to this yesterday, likely makes a certain segment of Twins fans happy. They really want the Twins to be sad and to feel bad. Rangers 5, Astros 3: Prince Fielder and Mitch Moreland each had nice days at the plate and the Rangers could use that from those two. Fielder’s solo homer in the bottom of the fourth was smashing. Rougned Odor homered too. Bad news for Houston, apart from losing to the Rangers yet again: Carlos Correa left the game with a sprained left ankle. He’ll miss a game or two most likely. Rockies 11, Pirates 5: Jorge De La Rosa has lost his spot in the Rockies rotation, but he came in and pitched four excellent innings in relief. Walt Weiss said after the game that his demotion “was a tough pill to swallow for a guy who’s been the best pitcher in franchise history” and I still can’t get my head around the fact that De La Rosa is the best pitcher on Rockies history. DJ LeMahieu homered, doubled and drove in three runs. Ryan Raburn, Charlie Blackmon and Nolan Arenado each drove in two. Yankees 6, Angels 3: Carlos Beltran hit a tiebreaking, two-run double in the Yankees’ five-run fifth, Ivan Nova was solid and the Betances, Miller, Chapman bullpen did what it was supposed to do to give the Yankees the win. New York is back at .500. But some bad news too as Chris Parmelee, a day removed from a two-homer game and a Daily News headline extolling his heroism, pulled his hamstring. Being the Yankees first baseman is like being the drummer for Spinal Tap. Orioles 6, Blue Jays 5: Chris Davis homered and hit a tiebreaking sacrifice fly in the ninth inning on a 2-for-3 night. That’s five wins in a row for the O’s and eight of their last nine since the calendar turned to June. Baltimore is kicking off a four-game road series against Toronto and Boston, by the way, so these are some big game for all three of what seem to be the most serious contenders for the division crown. Cardinals 3, Reds 2: Adam Wainwright was solid after a shaky start and Yadier Molina hit a tie-breaking RBI single in the eighth. He doubled and scored a run in the second inning as well. The Cardinals have taken 18 of the past 22 series from the Reds. Indians 5, Mariners 3: Tyler Naquin hit a two-run home run off Joaquin Benoit in the eighth inning to give the Indians what ended up being their winning margin. Mariners pitchers issued eight walks. You’re not gonna win often when you do that.